Gentlemen, please start your update engines! I have just released OSCulator 2.8.2. The are many fixes, but the two new cool things are the real-time input monitor, and the updated TouchOSC to MIDI templates with “bank button” support (more about that later). Log the event to the Console application. Nice, but too geeky and certainly too slow to set up. 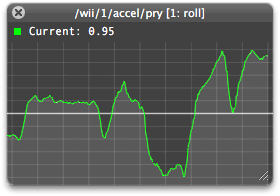 When activity is detected on the input, the line is drawn as a green line. If there is no activity, the line is white. You can see on the right HUD (heads up display) window that there is some input activity only when the button is pressed, whereas the left window shows continuous activity. There is a limitation though. Right now you can only monitor values from 0 to 1 (floating or round values it’s the same, they have to be between 0 and 1). This limitation will eventually be overhauled when I’ll have some feedback about this new feature. Second feature you might want to look at is the updated TouchOSC templates. TouchOSC has dark buttons to switch from one screen of controls to another, but it was not working until then. New templates have been added in the Sample Patches folder (you may have to download them again if you have updated OSCulator from the automatic software update process), they are configured by default to convert OSC to MIDI (and back). In these templates, when you change the screen in TouchOSC, it changes the preset in OSCulator. This is not only cool, but also allows for cleaner documents, more easy to understand. Included is also a stationary template with built-in preset change so you can use it to build your own templates as well. In the next days, I’ll talk about the new features with some short video tutorials. My friend Memo is not only a great installation maker, but also a dedicated programmer. Unfortunately, his application MSA Remote, has been rejected for the second time. MSA Remote is an iPhone application that has a clever design allow the user to map more than 200 faders and buttons using OSC. It also includes a TUIO compatible 2D touch surface with great feel and response. MSA Remote + VDMX + Ableton Live from Memo Akten on Vimeo. The astute viewer will notice a real-time graph from 00’05″ to 00’32″. This is a new component of OSCulator 2.8.2 that I am about to release (along with oh so many bugfixes). More about it later. Jim Purbick and his geek orchestra performed a cover of the Doctor Who Theme. 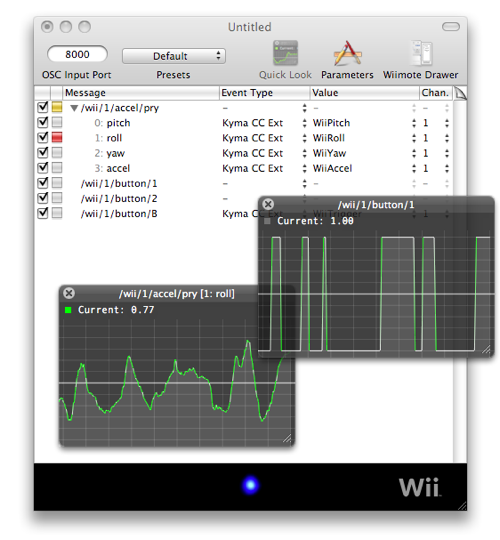 On his blog, he explains how he connected 8 iPhones and 2 Wiimotes to OSCulator, then to Ableton Live.